PVCStrip.com offers top-of-the-line, heavy duty strip door hardware that can be installed in a matter of minutes and lasts for years. The strips available at PVCStrip.com are all mounted on hardware that has standard measurements and fit nearly every strip curtain and door. The hardware is fabricated from 16-gauge galvanized steel with integral flush-mounted studs. All hardware comes with the appropriate number of retainer bars and kep nuts to ensure PVC installation to the desired lengths. PVCStrip.com hardware can be adjusted or trimmed with a band saw or hacksaw if needed. Hardware comes in different sizes, if we don’t have a solid piece of the width you ordered, we will send you a combination to arrive at your total feet. If you need a single solid piece, simply give us a call after placing your order. 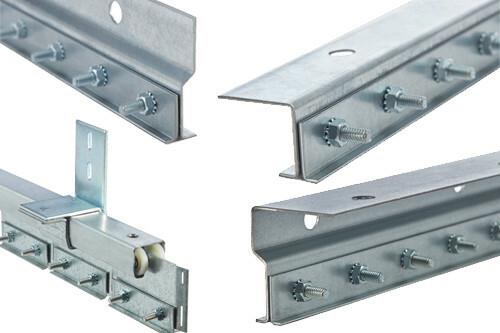 Several types of mounting hardware are available so that your door is mounted as effectively as possible. Wall mount hardware can be installed just above the door on the wall and is the most commonly request mount. Jamb mounts are installed directly in the door jamb but will reduce the overall door height by 2 inches to account for the added hardware. Slide mount hardware is also installed above the door but includes a slide rail that allows the door to be slid to one side of the door or the other. Press-Loc mounts can easily be installed with industrial strength adhesives (included) that enable you to mount the door where you desire. Pipe mount hardware is a system of fittings that utilize galvanized pipe to build a variety of strip door and strip curtain barriers and can be freestanding or attached to existing walls. Stand-off mount allows for strip installation where an existing door currently exists. For questions regarding hardware, please call 888-303-8515 or contact us.